Nokia 5233 Power Switch Problem Repairing Solutions are available in the following article. 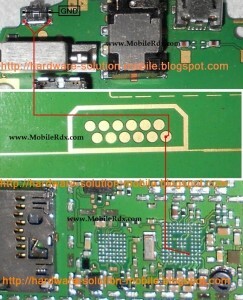 Also you will find Nokia 5800 Power Button Track Ways and Jumpers information in the diagrams further in this post. If your Nokia 5233 Power Button Ways or Power Switch also known as On/Off Switch is damaged somehow by whether mishandling or any other reason you can always replace it with a new one. But if the Power Button prints meaning Connection points on which the the Power Button is soldered to the Nokia 5233 Power Switch Key Ways on motherboard are broken, Diagrams in this article can help you.